It doesn’t matter what you may use, to keep reminding yourself to stay Conscious. 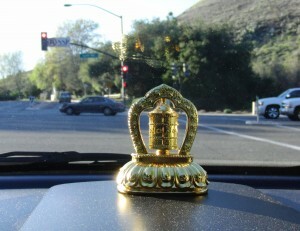 I have this solar powered prayer wheel on the dashboard of my car. As the sun rises it begins to turn. The Tibetan Mantra Om Mani Padme Hum are inscribed on the wheel, and while I drive, it makes a subtle turning sound. Recently I drove behind a truck that had a variety of stickers with slogans that are counter to the slogans I might choose. For example, the Peace sign sticker had a circle with fighter bombers inside it, with the message Peace the Traditional Way – implying that force is the way. Aaaarg! I find myself in argument with the driver of the truck, who I have never met, and I discover a rising anger towards him. Then I hear the subtle turning of my prayer wheel, and see the sun shine on its golden color: Ha, now the mantra comes into my Awareness. My thoughts shift away from judgments and self-righteous ideas, back to a place of openness and freedom. As soon as I realized where my mind was taking me, what story I was telling myself, I just laughed out loud and felt immediately free! Driving with this reminder, keeps my mental/emotional body in check. When the monkey mind wanders off down some well-worn pathway, we can be pulled back. This is of course a spiritual muscle that needs strengthening, just as much as the physical body needs that. I got my solar powered prayer wheel in Bhutan! Saw it, and HAD to have it. I believe there are only 3 of them in our town. If your desire nature has suddenly sky-rocketed, shop at Amazon!